Royan is a seaside town that manages to be pleasant and charmingly French in spite of its proliferation of post-war architecture. Maybe it’s the proliferation of fine sandy beaches (Royan has five of them), maybe it’s the consistently fine weather (the nice micro-climate of the Gironde Estuary is certainly an appeal) or maybe it’s just that it’s a great French town – full of life, commerce and seaside fun. 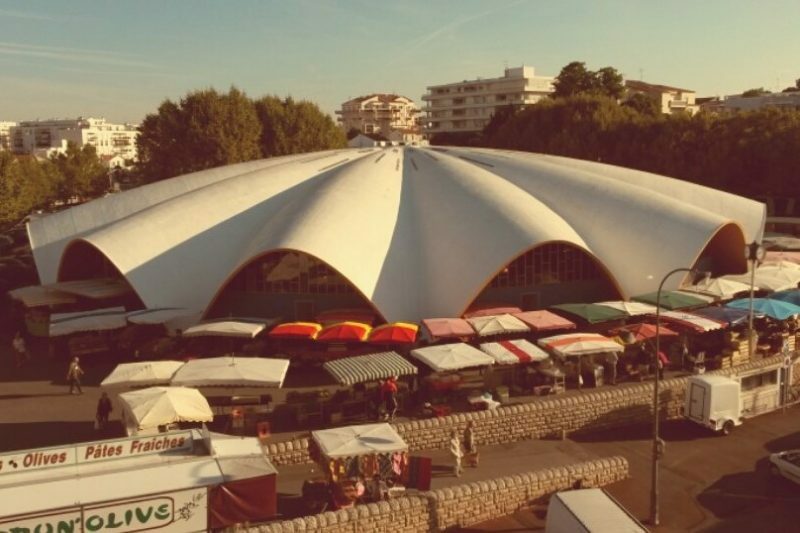 In any case, the central daily market in the Halles Centrales on Boulevard Briand is a good reason to love the town. Typically, they’ve gone for a circular modern-looking shell structure, as opposed to the more typical turn-of-the-century steel-and-glass approach. The inspirational building was constructed in the mid-1950s, restored in 2003 and benefits from having no internal pillar supports. The usual mixture of delights are to be found here every day of the week (in season – see below), with a huge emphasis on enormous fruit and fresh fish and shellfish. Opening hours are from 07:00 to 13:00 every day from the 1st of July to the 31st of August. From the 1st of September to the 30th of June, it is open every day except Monday.